Chinese New Year has arrived, but unlike previous years, I haven't managed to do any CNY nail art! But, I didn't let my nails go bare! I painted them with Make Up Store Doreen! Chinese New Year Nails: Make Up Store Doreen, which I finally decided not to ignore. Isn't that pretty? I actually bought Doreen a long time ago (gosh, it sounds like I'm buying a person, but I'm not), and used it a couple of times last year, and then forgot about it. But, with Chinese New Year around the corner, I was rummaging through my nail polish stash, and I decided that this beauty needed another go! I mean, CNY is the perfect season for red, right? The great thing about Make Up Store's Doreen, to me, is the glass fleck finish. 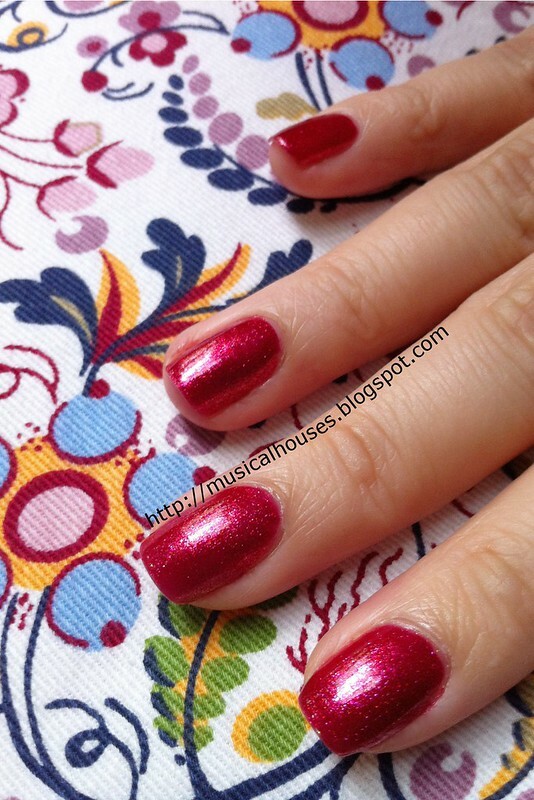 I don't have too many glass fleck nail polishes, and I always love looking at how the colour just reflects light and adds more interest to the colour, particularly a colour as basic as red. Red cremes are nice and all, but they are boring - I mean, which brand doesn't have a plain ol' red creme? Red frosts, if streaky, just look kind of dated to me - like something my grandmother might wear, if she was into nail polish. Red shimmers could go either way, but are highly dependent on the type of shimmer present. Red glass flecks? Awesome. 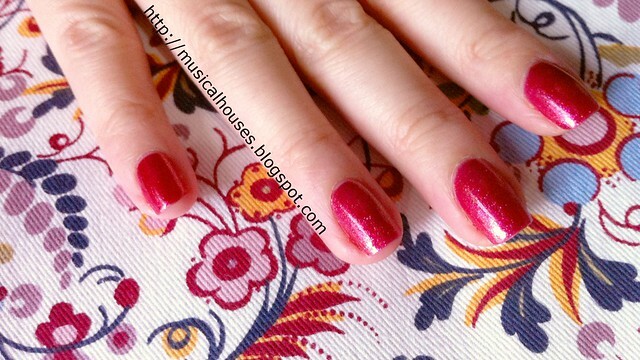 Chinese New Year Nails: Make Up Store Doreen has a glass fleck shimmer that adds interest. And even then, Make Up Store's Doreen isn't entirely red. It's more like coral-red to me, which makes it even better, because the addition of coral makes it also more interesting than your standard-issue red. Not that I don't like standard-issue reds, I just have a couple of them already, and don't differentiate too much between one or the other, to be honest. Application was good. No issues with brush or texture. Generally smooth all the way. What you see here is two coats, with a topcoat, in natural light. Sorry for the blurry non-macro quality of the photos, these were taken with my iPhone 4. Yes, iPhone 4. Not 4S, or 5S or 5C or whatever Apple is putting out there these days. Just an iPhone 4 that's still running on iOS 6. (I still haven't upgraded to iOS 7 yet, oops...) I'm a dinosaur when it comes to phones, particularly here in Asia where the norm is to upgrade your phones every 2 years or so. But I digress. Make Up Store Doreen: Chinese New Year red, with a generous hint of coral. The lasting power of Make Up Store Doreen was also good, fairly average, with about 3-4 days before any noticeable chips appeared. This is typical for me. While in previous years I've been more adventurous with my Chinese New Year nails, with previous nails having Chinese New Year bling nails, or pearls and strokes, or glitter gradients, but this year, I just haven't found the time yet (if not, you can bet I'd be doing something loud). But, just having a pretty red colour makes me happy, and that's all that matters at the end of the day! The Bottom Line: A pretty coral-red shade, combined with a glass-fleck finish, make this a great red that isn't boring to wear.